USD Partners, a rail terminal operator owned in part by Wall Street giant Goldman Sachs, has signed a nearly three year deal to facilitate moving tar sands by train from where it is extracted in Alberta, Canada, to an offloading terminal in Stoud, Oklahoma, in a route mirroring that of the Keystone XL pipeline. From Stroud, the heavy oil can be sent via pipeline to the nearby oil storage hub in Cushing, Oklahoma. USD‘s announcement, which said the company could transport up to 70,000 barrels per day of tar sands in rail cars, came in a June 2 filing with the Securities and Exchange Commission (SEC). Ironically, as reported by DeSmog’s Justin Mikulka, Goldman Sachs penned a 2013 report titled, “Getting oil out of Canada,” which said tar sands–by-rail was not economically viable. However, in the years following that report, USD, with the backing of Goldman, has entrenched itself more deeply in the tar sands–by-rail market. In Hardisty, Alberta, where the tar sands–by-rail journey begins, USD Partners owns a major oil-by-rail shipping facility. The Hardisty facility currently has the ability to handle two tar sands–by-rail shipments per day, equivalent to 120,000–140,000 barrels per day of crude. This latest deal will represent a quarter of the site’s business. “Inbound product” shipped from Alberta to Stroud “is delivered by the Stillwater Central Rail, which handles deliveries from both the BNSF and the Union Pacific railways,” explains the USD Partners press release. BNSF is owned by Warren Buffett, who is a major campaign contributor to Democratic Party candidates, including 2016 Democratic Party presidential nominee, Hillary Clinton and former President Barack Obama. Canadian Prime Minister Justin Trudeau has shown deep support for tar sands development, to the dismay of environmentalists. The tar sands have a larger carbon footprint than other oil products when accounting for the product’s entire life cycle — making it bad news for the climate. The announcement by USD comes as the investment research and management firm Morningstar has released a report which concluded that tar sands are currently being carried at record levels via rail, up to 183,000 barrels per day in March, with those figures likely on the rise. 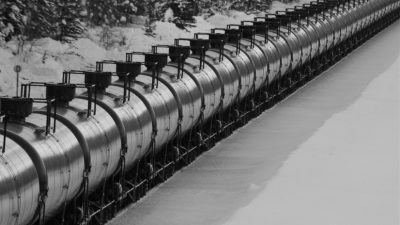 “Given that no new crossborder pipeline capacity is expected on line before 2019, we expect Canadian crude-by-rail traffic into the United States to continue growing as production increases,” reads the report. Several former Goldman Sachs bankers serve in the Trump administration, including Trump’s top economic adviser Gary Cohn, who previously worked as the bank’s president and chief operating officer. Steven Mnuchin, Trump’s Secretary of the Treasury, also formerly worked for Goldman as chief information officer. Another senior economic adviser, Dina Powell, has served as president of the Goldman Sachs Foundation, while Steve Bannon, one of Trump’s top aides, was a vice president for Goldman. Goldman Sachs also had a key person in Hillary Clinton’s corner: CEO Lloyd Blankfein. Blankfein endorsed Clinton’s run for president both in 2016 and 2008. Cohn was also a donor to Clinton both as a U.S. Senator and during her 2008 run for office, giving $5,600 in total to Clinton’s campaigns, according to data posted on OpenSecrets.org. And the banking giant itself paid Clinton $675,000 to address company executives three times after her tenure as U.S. Secretary of State. Prior to surrounding himself with Goldman Sachs bankers, Trump critiqued what he described as their “control” over his opponents during the 2016 election cycle. Stroud, Oklahoma, was the end point for the first delivery of oil-by-rail shipped from the Bakken Shale in North Dakota in 2010. Until purchased by USD Partners, the Stroud facility was owned by EOG Resources, a company formed out of the ashes of the now-defunct Enron. Just weeks earlier, Buffett announced the purchase of BNSF through his holding company, Berkshire Hathaway, which sent shockwaves through the shipping market for U.S. oil obtained via hydraulic fracturing (“fracking”) and opened the door for the “bomb trains” boom. Stroud, according to the 2013 environmental impact statement (EIS) published by then-President Barack Obama’s State Department, has the capacity to handle a similar amount of oil per day as TransCanada‘s Keystone XL pipeline, approved earlier this year by President Donald Trump‘s administration. The Alberta-to-Oklahoma oil-by-rail route was viewed as a prospective pipeline alternative. “Under this scenario, up to 15 unit trains per day would arrive at Stroud” and “seven rail terminals would be built,” according to the EIS. The Gulf Coast pipeline, the southern leg of Keystone XL approved by President Barack Obama during a March 2012 presidential campaign stop in Cushing, also passes through Stroud on its way south to Port Arthur, Texas. The American Journal of Transportation described USD Partners as a “pioneer” of shipping oil by rail and tar sands by rail, crediting the company with reshaping U.S. oil markets. The head of USD Partners has in turn credited Goldman with its increased clout in the oil-by-rail orbit.